Star Liana York is one of those artists who has not allowed success to breed complacency. Long recognized as one of the premiere figurative Western and wildlife sculptors in the country, she has won numerous Best of Show Awards, and has been featured on numerous magazine covers. On its 30th anniversary, Southwest Art selected her as one of the most influential artists profiled in their magazine over the previous three decades. Although her reputation was built on detailed and convincing bronze representations of the American West - from Native American men and women, to cowboys and critters - there has also been an independent streak to her subject matter. A few years back, her one-person show at a Santa Fe gallery was titled "Departures," and not one of the sculptures exhibited resembled work she had done before. Most recently another gallery show revealed her fascination with effigies, fetishes and ceremonial vessels. 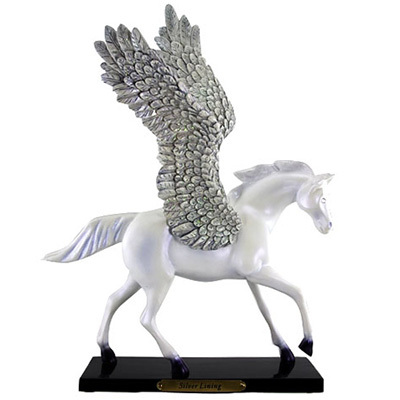 Is it any wonder that Star is the sculptor commissioned to create the horse forms for The Trail of Painted Ponies? A native of Upper Marlboro, Maryland, Star grew up in a rural area with a dairy farm behind her home. She was the middle-daughter in a family of five and she credits her mother, a former ballerina, and her father, a woodworker who built the stages on which her mother performed, for a talent that led, by the time she was in high school, to her winning Scholastic Art awards for her miniature sculptures, and signing on with a catalog company to create fantasy figures and figures from mythology. But it is horses that have been the constant in this artist's life - both personally and professionally. 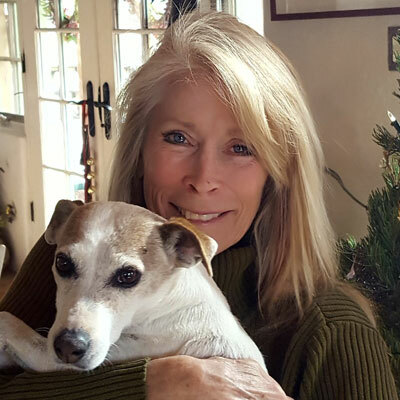 She rode competitively as a teenager and put herself through the University of Maryland by exercising racehorses at Laurel Racetrack and running a horse boarding operation. Her knowledge of horse anatomy and ability to render horses in a variety of positions and forms found expression in gold and silver miniatures which she sold in East Coast art galleries. Jump ahead some ten years and she is living in Santa Fe, New Mexico, where she has moved to be closer to her bronze foundries and the experiences and cultures that have become the focus of her art, and you still find horses at the center of her life. She is breeding and boarding horses. She exercises her horses daily in the National Forest. She has taken up the sport of Polocross - an Australian import that is a lot like lacross on horseback - and she "stars" on a team that becomes national champions. In parallel fashion, horses have become the focus of her work. 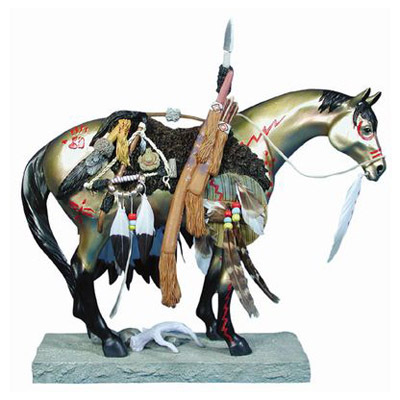 She creates a series of bronzes featuring cowboys and Indians on horseback. She becomes interested in the way horses are rendered by early European cave painters, and after seeing them first-hand on a trip to France, she imaginatively creates a collection of Rock Art Ponies that reflect the playful possibilities that would occur if these ancient horses were to materialize off their rock wall into three-dimensional creatures. In a bronze titled "Homage to Da Vinci," she pays respect not only to the master artist, but to the powerful creature that she feels has taught humans much over the centuries. "Horses are good teachers because they don't carry grudges or have hidden agendas. They are always willing to forgive our mistakes, if we give them half a chance. In short, if we let them, they can make us better people." Then along came The Trail of Painted Ponies. Involved in the initial planning of the Santa Fe-based public art project, it was a natural for Star to be the sculptor selected to create the horse forms that would be presented to artists to paint. Indeed, she painted a life-size Pony herself - a tribute to Georgia O'Keeffe titled "Georgia On My Mind." 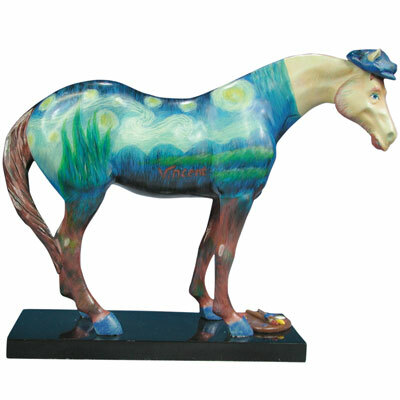 She also painted several other original ponies that have since been crafted into collectible figurines: "Go Van Gogh," since retired, and "Medicine Horse " and "Silver Lining." It is The Trail of Painted Ponies she points to as the inspiration for her latest artistic direction: collaborations with other artists. "The Painted Pony project opened my eyes to the value of collaborating. I found myself in a position of watching how other artists took a form I had created and turned it into a completely different work-of-art that was their own. In a way I hadn't thought about, a collaboration was taking place. I liked that sense of an aesthetic dialogue taking place, and this led to the idea of intentionally collaborating with other artists." This interest resulted in a series of collaborations with her husband, Jeff Brock, a stone sculptor and metal fabricator. "I created an original bronze horse, he carved stone fetishes using material he found in the National Forest, and the result was something neither one of us could have done on our own." But it is Star's collaboration with Cathy Smith, a master of the classic arts of Plains and beaded quill work, and an Emmy award winning costume designer whose credits include Dances with Wolves, Son of the Morning Star and Buffalo Girls, that has produced some of the most striking collaborations. 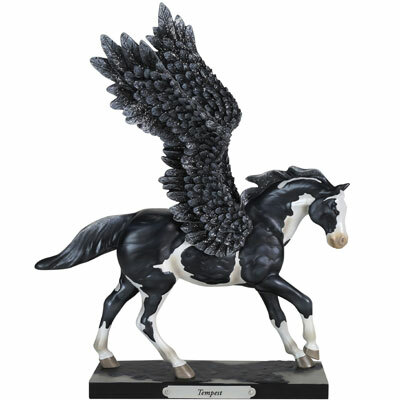 The collectible figurine "Medicine Pony" was a collaboration between the two, as well as the phenomenal "Ceremonial Pony," a life-size bronze Pony that was the original model for The Trail of Painted Ponies. 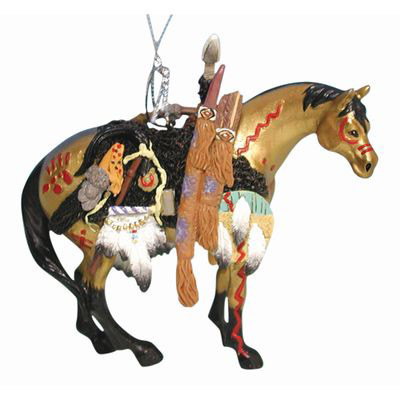 Stunningly adorned with authentic buckskin and beaded accessories, it is currently on exhibit at The Gallery Four Seasons Resort in Scottsdale, Arizona, where it represents the zenith of what Star refers to as "Spiritual Liaisons." On a horse ranch about an hour's drive north of Santa Fe, in Georgia O'Keeffe Country. Where do you do your art? I just built a new studio, and it overlooks a horse pasture, backs up to the acequia so in summer I can listen to the water running, and it is positioned so I can watch the sunrise in the morning and the sunset in the evening. There are so many, but oddly enough, lately I have found myself influenced by Andrew Goldsworthy, the British artist and photographer who produces site specific sculpture and land art situated in natural settings. His media often includes mud, snow, ice, brightly colored flowers and leaves. After they are assembled he photographs them, they melt back into the earth, or are washed away by the tides. I can relate to his feeling and connection with nature. I have two. American Beauty, because it's the best movie I've seen that expresses the extraordinary beauty in life that we so often overlook as ordinary. That, and Moulin Rouge because it reminds me of how it feels to fall in love better than any work of art I've experienced. It's important to be reminded of these things every day, and enjoy all the many gifts that we can too easily take for granted. Yellow. Because it's the color of light and warmth. Also, when I was young my mother gave all three of the girls a color, and often dressed us in clothes of that color. My sisters were pink and purple, and I was yellow. Mariah, my 27 year old Quarterhorse mare who acts like she's four. She's smart, athletic, sensitive to her surroundings, and she has a big heart. Everything I'd like to be. Live the life you dream about.